A Development or Release folder containing your generated build output files (which folder depends on whether you do a development build or not). A TemplateData folder (at least when building with the default template), containing the loading bar and other template assets. See the User Manual page on WebGL templates for more information. A MyProject.mem file containing a binary image to initialize the heap memory for your player. A MyProject.data file containing the asset data and scenes. 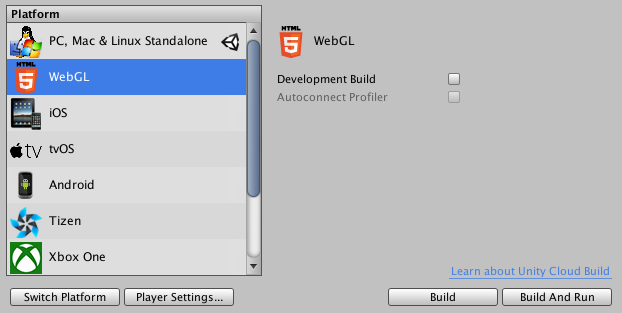 A UnityLoader.js file containing the code needed to load up the Unity content in the web page. On some servers you need to make .mem and .data files accessible because the server needs to provide these files to clients. This option only appears when you have the Development Build checkbox checked. Use the Use pre-built Engine option in the Build Settings dialog box to speed up build iteration time during development. 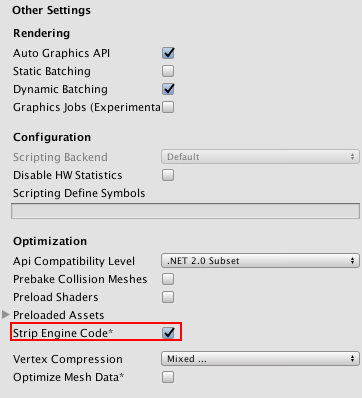 When this option is enabled, Unity rebuilds only the managed code and then links dynamically with the pre-build Unity engine, so the project is rebuilt approximately 30–40% faster. Note that this type of build is only suited for development purposes, as it always produces unstripped engine code. Also, due to the dynamic linking overhead, the performance of this type of build is slower than a normal build. 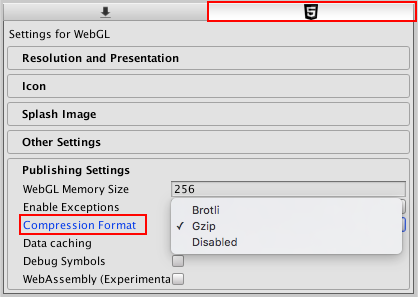 Open Publishing Settings to access the WebGL Memory Size field. Here, you can specify how much memory (in MB) the content should allocate for its heap. If this value is too low, you will get “out of memory” errors. This means your loaded content and scenes cannot fit into the available memory. However if this value too high, your content might fail to load in some browsers or on some machines, because the browser might not have enough available memory to allocate the requested heap size. This value is written to a variable named TOTAL_MEMORY in the generated .html file, so if you want to experiment with this setting, you can edit the .html file to avoid the need to rebuild your project. See the User Manual page on WebGL memory usage for more details. Unity generates these exceptions by embedding checks for them into the code, so this option increases the code size and slows down performance. Use this mode only when you need to debug issues in your code, as it generates very large and very slow builds. When you use class types in your AssetBundle which are not used in your main build, Unity may strip the code for those classes from the build. This can cause a fail when trying to load Assets from the AssetBundle. See the section on Stripping, below, to learn how to fix that. If you want to change the location of your output files relative to the index.html file, you can do so by editing the dataUrl, codeUrl, and memUrl fields and the UnityLoader.js script tag in the index.html file. You can specify URLs on external servers for these if you want to host your files on a content distribution network (CDN), but you need to make sure that the hosting server has enabled Cross Origin Resource Sharing (CORS) for this to work. See the manual page on WebGL networking for more information about CORS.